Utah State's Jordan Love throws a pass against Boise State during an NCAA college football game Saturday, Nov. 24, 2018, in Boise, Idaho. Boise State won the game 33-24. Boise State is still the flagship football program in the Mountain West, but the playing field is as level as ever. And as the quarterback position goes, so go preseason predictions, right? BOISE, Idaho — Monday, April 15, 2019. Utah State spring football wrapped up Saturday with the Aggies’ spring game. Nothing to see here. Move along. And that’s the good news for USU. It was so uneventful that no stats were kept, but junior Jordan Love did throw two touchdown passes while he was in. It was Love who led the Mountain West in pass efficiency last season at 158.3, topping Fresno State’s Marcus McMaryion and Boise State’s Brett Rypien, as he threw for 3,567 yards and 32 touchdowns against six interceptions. And that came during an 11-2 season that saw the Aggies in the thick of the Mountain West race until the final game of the regular season, when they lost to the Broncos 33-24 on the blue turf on Thanksgiving weekend. 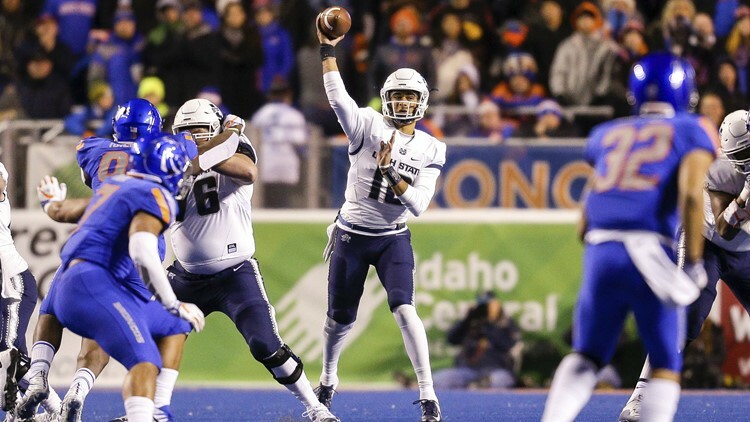 Where will Boise State and Utah State shake out in preseason predictions this summer? Could be it’s the Aggies who are picked to win the Mountain West’s Mountain Division. Jordan Love is the proven quantity under center that the Broncos don’t have, and everybody starts at quarterback when evaluating a team’s dynamic. The wild card: coach Gary Andersen, who has returned to Logan to replace the guy who replaced him, Matt Wells. Andersen is the unknown factor in this 2019 puzzle. But we can’t forget new USU offensive coordinator Mike Sanford, who once held the same position with the Broncos. With Love at his disposal, Sanford is intent on sustaining the Aggies as a points-scoring machine. LOOK FOR LAWRENCE IN SEPTEMBER? DeMarcus Lawrence’s shoulder surgery last Wednesday has been declared a success. They rolled the former Boise State star right into the operating room the day after he signed his monumental five-year, $105 million contract with the Dallas Cowboys. Recovery time? Depends on who you talk to. Lawrence’s agent, David Canter, cautions it could be up to six months. The Cowboys say closer to four months. Lawrence splits the difference and says he’ll be ready for the start of the season. The Kelly Cup Playoffs could not have started worse for the Idaho Steelheads Friday night in CenturyLink Arena. Utah embarrassed the hapless Steelheads in a stunning 7-1 rout. Tomas Sholl, runnerup for ECHL Goaltender of the Year, was uncharacteristically Swiss cheese-like while allowing all seven goals. Could the Steelies flush that for Game 2 Saturday night? They almost didn’t, but in the end they did. Idaho rallied from a 2-1 third period deficit to tie the game on a Henrik Samuelsson goal midway through the final frame—then Kale Kessy netted his second tally of the night almost eight minutes deep into the overtime period to secure a crucial 3-2 victory over the Grizzlies. The series now moves to Utah Wednesday night. Utah State spring football has already been a subject today. Now, USU basketball, where true freshman center Neemias Queta has announced that he’ll declare for the NBA draft but will leave the option open on returning to the Aggies. Queta was essentially the difference as Utah State shocked the Mountain West by rolling to the conference tournament title last month after being picked ninth. The 6-11 Portuguese center was the league’s Freshman and Defensive Player of the Year after blocking 84 shots. Queta averaged 11.8 points and 8.9 rebounds per game for first-year coach Craig Smith. Prediction: he’ll test the waters, get some expert NBA tutelage, and return to Logan to make the Aggies the 2019-20 MW preseason favorite. Steve Alford didn’t want to break out his roster during his introductory press conference at Nevada Friday. After seven seniors departed and seven more entered the NCAA transfer portal, there were only three players back. But Alford’s hiring saved one of the potential transfers, as the Wolf Pack’s leading returning scorer, guard Jazz Johnson, announced he is staying for his senior season. Johnson, the Mountain West’s Sixth Man of the Year, averaged 11.0 points per game this past season. He was the Pack’s top three-point shooter and went 9-for-16 from deep in three games against Boise State. The Boise State women’s softball program knew how fortunate it was when former Eagle High star Bradie Fillmore decided to transfer home after one season at Cal. Over the weekend, the Broncos counted the ways. How about four home runs and nine RBI as Boise State swept Utah State in a three-game series at Dona Larsen Park? In Sunday’s finale, Fillmore hit a three-run homer to add to a solo shot during the Broncos’ 12-8 win. Boise State scored 32 runs in the series while evening its Mountain West record at 6-6. More than 25,000 fans witness history as Jackie Robinson bats second and plays first for the Brooklyn Dodgers, breaking major league baseball’s color barrier. It was Opening Day at Ebbets Field, and the 28-year-old Robinson, signed by Branch Rickey, went 0-for-3 against Boston Braves starter Johnny Sain but scored the deciding run in the Dodgers’ 5-3 win. Robinson retired after the 1957 season, and his No. 42 was retired throughout the majors in 1997. The last player grandfathered in to wear it was the Yankees’ Mariano Rivera in 2013.